Squire Patton Boggs conference room. All Systems Off view. Recently we were asked by Squire Patton Boggs, a legal firm with offices in over 20 countries to help with their downtown Phoenix conference floor. 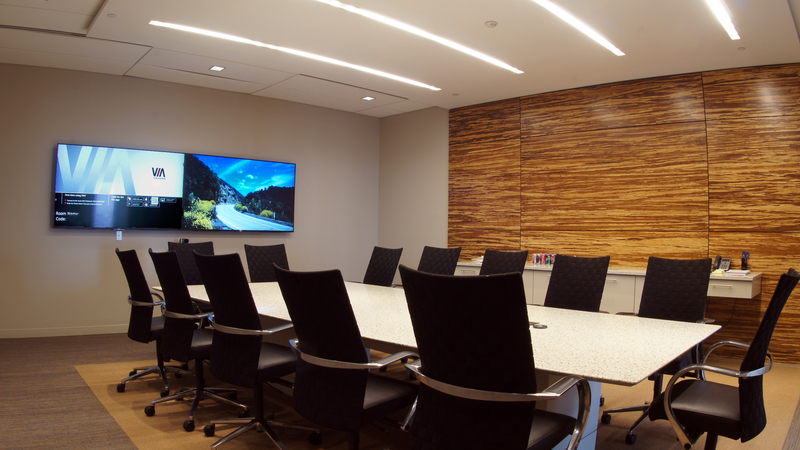 The project included 4 conference rooms that all needed an upgrade. We just completed this large project and thought we would use it to highlight some of the latest industry technologies. As many organizations have geographical limitations in getting the whole gang together, video conferencing has become a daily occurrence in most business environments. At Arizona Audio Visual we are the video conferencing experts. Squire Patton Boggs has a dedicated conference room for this purpose. We incorporated 2 large Sony TV’s and a PTZ (Pan Tilt Zoom) camera for the video element of the conference. The far side of the conference is heard through ceiling mounted speakers. The whole system is controlled by a small form factor computer. 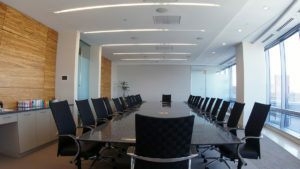 In each of the 4 conference rooms we installed an RTI control system. The system controls the audio system, video system and in this case, both the lighting in the room and the motorized window coverings. Staff at Squire Patton Boggs control the system using a wall mounted touchscreen. One of the biggest challenges in a work environment when using a projection system is dealing with the ambient light. This requires a large projector with a lot of output to overcome all the natural and man made lighting in the space. We are fortunate to have partnered with Vivitek a leading manufacturer in large format projectors that can easily handle this type of environment. The latest technology is in laser projection. Laser projectors never need a new bulb and are whisper quiet. Most people would be surprised in how much technology goes into manufacturing a video screen. Apart from the obvious choice of either permanent wall mounted screens or motorized versions, there is a lot of research and tech. involved in the screen material. Todays screens are designed to reject ambient light and can handle the latest 4K (UHD) projectors. We have partnered with Texas based Screen Innovations who offer screens for virtually any application. Our clients have a lot of choices when it comes to microphones for their conference room. The old conventional wired systems are still around and work great. Most clients however, prefer some form of wireless system or more often a system that is integrated into the ceiling leaving a clean conference room table. 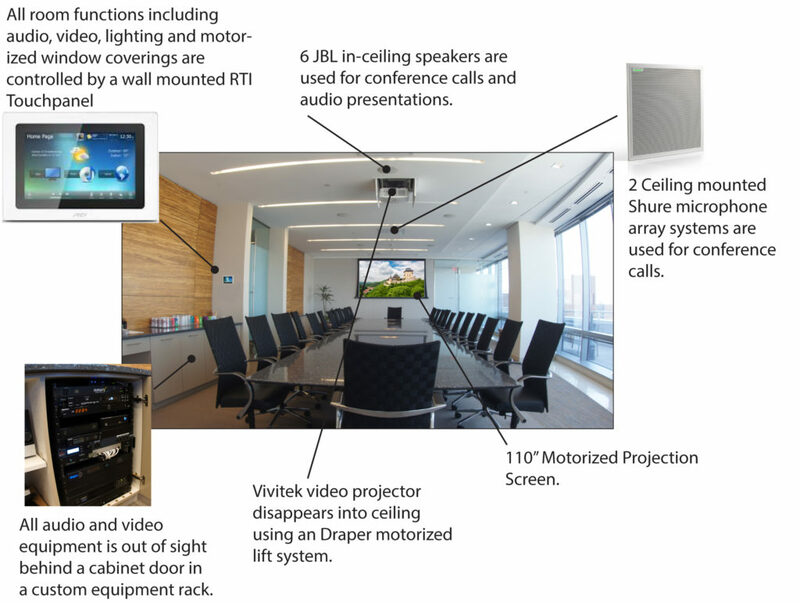 Squire Patton Boggs selected the latest microphones form Shure that are ceiling mounted and can be steered to specific seating and height locations throughout the room. This is done using new beam forming digital microphones. The result is amazing. Another significant leap forward in our industry is the introduction of furniture and equipment storage systems that can put all of the AV equipment out of sight in an organized easy to service manor. No more mess of wires that no-one can make heads or tails of.